10Judy has been water monitoring, educating youth about environmental stewardship and training volunteer monitors in central Alabama, along with working full-time (until recently), over the past couple of decades. She has monitored both water chemistry and bacteria in the Montgomery area and in the Lake Martin area, and submitted over 100 data records from 13 different sites to the AWW database! She became certified in both water chemistry and bacteriological monitoring, and has conducted numerous workshops in both. 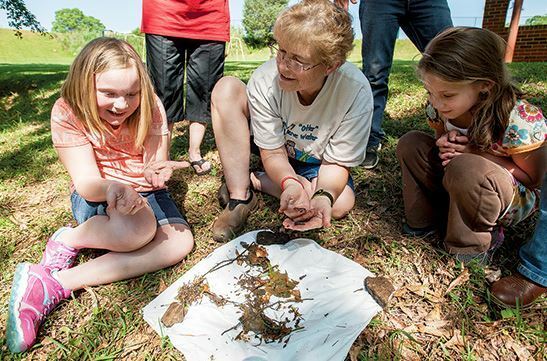 Dadeville Elementary School students get hands-on science lesson from Lake Watch of Lake Martin water monitor and trainer, Judy Palfrey (source: Cliff Williams /The Record, 5/14/2015). I call Dadeville my home and have lived in this house for 23 years now. I knew about the area for quite a while since I was the UPS driver for about 10 years. Lake Martin is my favorite lake, and Saugahatchee is my favorite creek. I love canoeing but haven’t been able to go in a while, and I also love to swim. I go to Dare Park since I sample for bacteria at that location and know it is safe. 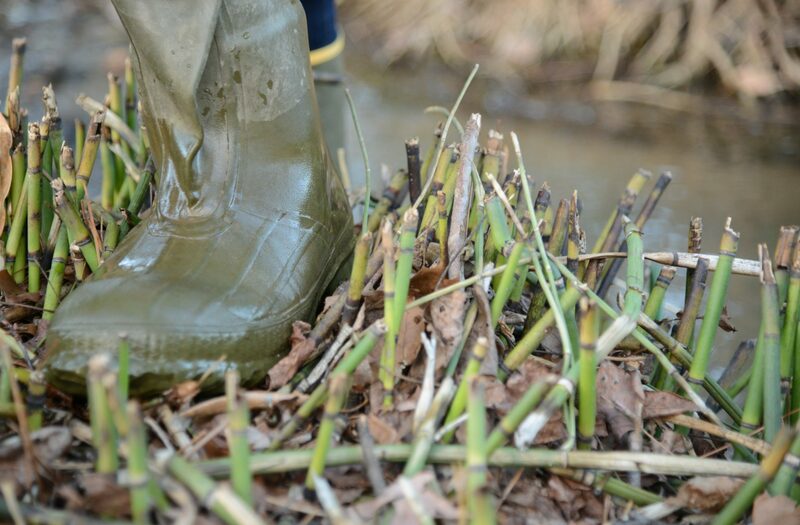 Is sampling counted as a water sport because I really enjoy going out sampling and check for macroinvertebrates with my grandchildren when I get a chance to do so. I was raised in the Catskill Mountains of New York and played in the pristine creeks of that area. In fact, my grandfather and I would look for mayflies so we could go fly fishing. When a friend of mine came down to Opelika, she asked why our water was always so muddy and this was the beginning of my wanting to do something but I didn’t know what to do. Marilyn Garrett from SOS, got me to join the League of Women Voters and I eventually became the Environmental chair. With the creek smelling funny, our well being contaminated, and the Auburn water system contaminated, I knew someone needed to do something so I got involved with AWW. Judy inspired her daughter Heather to educate youth in watershed stewardship and to become an AWW monitor. 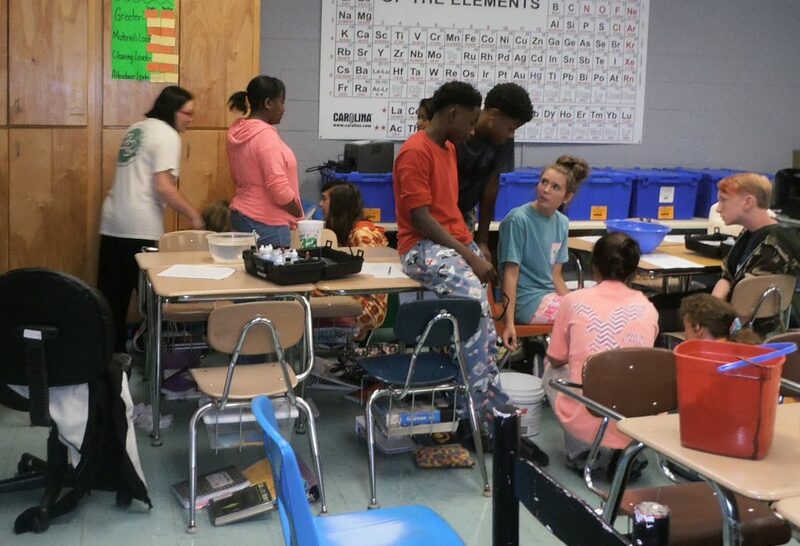 Above, Heather is demonstrating AWW water chemistry to an 8th grade class. Since working in Montgomery as an Environmental Technician, I saw an enormous amount of problems and what people would or wouldn’t do to keep the water clean. Here in Saugahatechee Creek as well as Sandy Creek, the sediment is so thick it looks like a mud flow rather than a creek. We have had bacteria problems but sediment has not slowed down at all. I have found in all the places that I teach, many folks don’t realize where our water flows or, they think it is going to be cleaned by someone. We need to teach not only children, but adults as well. Teach all children – public schools, private and homeschooled, and try to get the parents involved. Most people learn more with hands-on activities such as the Enviroscape. When I worked at the fair or at the zoo, I had a lot of people say that they didn’t know the facts. Those of us that can teach really need to get out there and ‘just do it’! 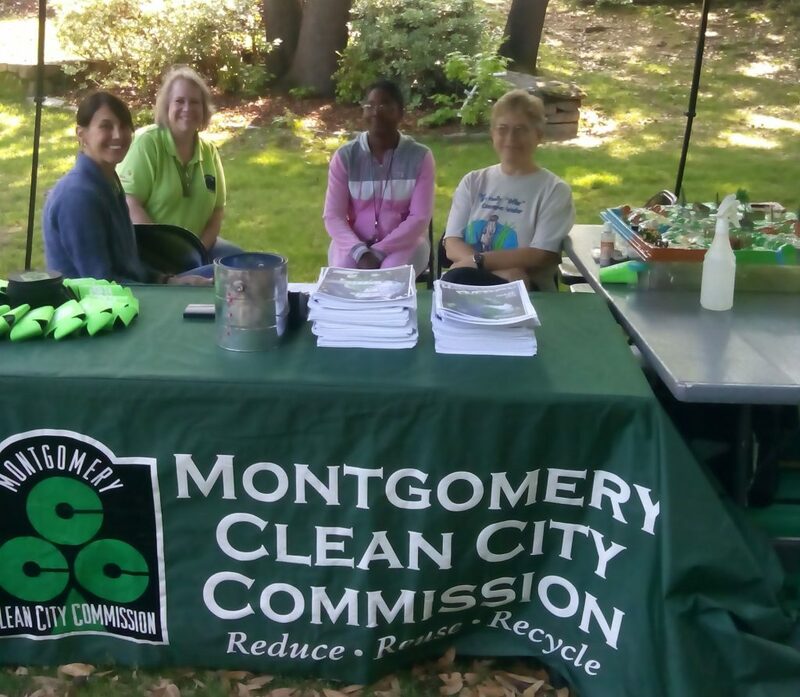 Judy (on right) promoting ‘Reduce-Reuse-Recycle’ with friends at the Montgomery Clean City Commission.